Step 1: Sell a magical flying horsie online for 25 dollars. b. See figure 1b, entitled "How To Force Your Playerbase To Camp The Browser, Because If They Get Up To Pee In The Next 7 Hours, They Might Just Miss Their Magical Pony Chance"
c. LOL as you roll in money that people are lining for 7 hours at a time up to throw at you. Really, Blizzard? I mean... really? I tell ya, if they really do sell 80,000 horses then that's a cool $2million in the bag. Easy money for Blizz. I don't see anywhere that they're limited supply. Not on the announcement, not in the description in the store, not anywhere. The FAQ even says that they have no plans to remove it any time soon. Where does it say this? Oh, you mean the little thing that says "94% stock"? My friends and I were just assuming that the online store requires a "number available" field, and they just set it to some arbitrary high number. One of my friends said it was at 49% for a half hour. I doubt that actually means they're going to RUN OUT. If they were only planning to sell a certain number of them, they would have said so in their announcement. The line is to stop people from e-baying them. Pro-tip: make it a link from your account management area in www.worldofwarcraft.com, so it's bound to that account. Or gift it to a specific character on a server, and their entire account gets it. No more camping. I suspect that in their quest to go green and curb inflation, Blizzard has switched to money-burning power plants. 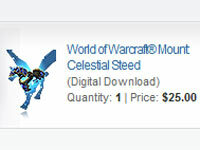 This mount is by far the most profitable item currently available in their store. I've had 3 alts one in each majorly populated capital (IF,Sw and Dala) and counted over a 100 of these shortly after it being available yesterday. I figured the queue was there to avoid overloading their banking provider and billing systems. They're pushing through 2 to 3 transactions a second on these two items, on top of normal business. Would you rather a queue, or the Fail Murloc? let the process queue, then, but take the order now. Like, enter your CC info, and hit 'yes I want a magical pony', then receive a page saying 'your order will be processed over the next 7 hours, please be patient'. Not 'don't go anywhere for seven hours, cuz we're trying to recreate the EQ mob camping experience for a sec here'. I bought mine last night around 10 PM, and there was no queue. I'm glad I waited for the store to calm down a bit before trying for it. I am confused to why anyone would buy these, let alone almost 7000 at a time. The store itself does not act as a generator for loot codes, so a set number of codes had to be added to the store. That number is very high. If it's ever reached, we can add more. The item offer isn't intended to be of a limited quantity. The queue time estimate was completely inaccurate. When I joined the queue it said I was number 155678 with an estimated wait time of 10 hours. It took around 50 mins. My bf bought me my horsie, I lluuuurrrvvveee itttt. I still feel slightly guilty though. IMHO I see no reason that they can't just change where it says "% stock left" to "% of codes left before we generate more"
It's honest , straight up and makes the customer aware if they do run out of codes just wait to order until they order some more. "It's honest , straight up and makes the customer aware if they do run out of codes just wait to order until they order some more." I mean for the customer to wait before completing their order until more codes are generated. They could even put something on the page saying we can email you when more codes are generated. That is in the highly unlikely situation where they run out of codes before some intern has to go click a few buttons to fill it with a few bazillion more codes. "let the process queue, then, but take the order now. Like, enter your CC info, and hit 'yes I want a magical pony', then receive a page saying 'your order will be processed over the next 7 hours, please be patient'." Or I already have a thread over there about improvements in the digital download process do I have your permission to post that there ? Is this going to be another classic downfall scenario where a smallish company with a good ethic ends up being the victim of its own success ? I've never actually seen any quotes where Blizzard explicitly say they will never do faction changes or race changes. The posts I've seen have the Blues talking about how "we have no future plans at this stage to do so"
Things change over 5 years of being out and the player base has changed. The world has changed. And obviously Blizzard's stance on things has changed.